I’ve spoken in depth previously about suffering with the skin condition psoriasis. For the past five years, I have been under the care of a dermatologist and rheumatologist to help deal with both the psoriatic arthritis and psoriasis issues I have had. Luckily, we were able to manage and maintain both of my conditions with the intervention of drugs. I say luckily but these drugs are strong with harsh side effects and the process of getting to the point of having everything under control, was long and gruelling. As these drugs are extremely powerful they are not safe to take or use during pregnancy. When we decided to try for another baby all medication was stopped. Since psoriasis cannot be cured and only maintained it has meant that I have noticed it begin to come back. 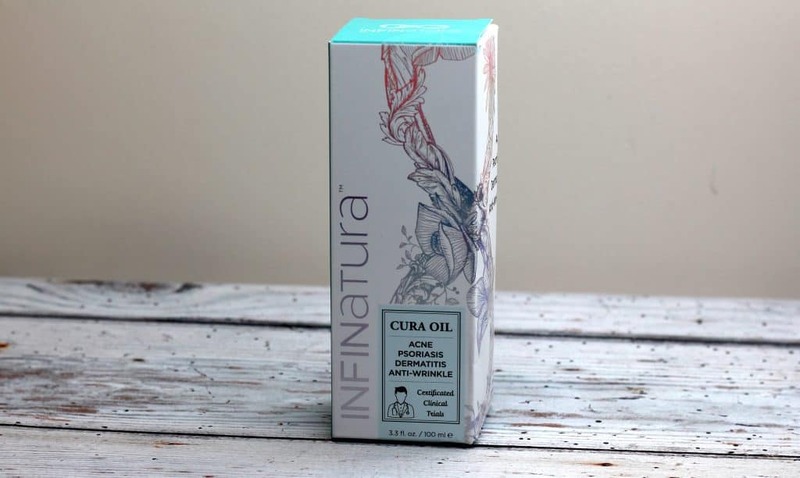 So, when I was offered to try INFINatura Cura Oil which has undergone certified clinical trials and is said to improve psoriasis and other skin conditions – yet is natural, I of course was completely on board. It’s only when you become pregnant and you learn all the things you ‘shouldn’t’ take or use that you realise how strong and harsh some of the ingredients contained must be. I’d love to go completely natural with medications and treatments I use. I like the idea of using something less chemical based and reverting to something much more natural. I have to cynically admit though that in the past I have used my fair share of herbal and natural remedies to no effect. For this reason, I am always dubious of trying natural products with big promises as I have been left disappointed on many occasions. 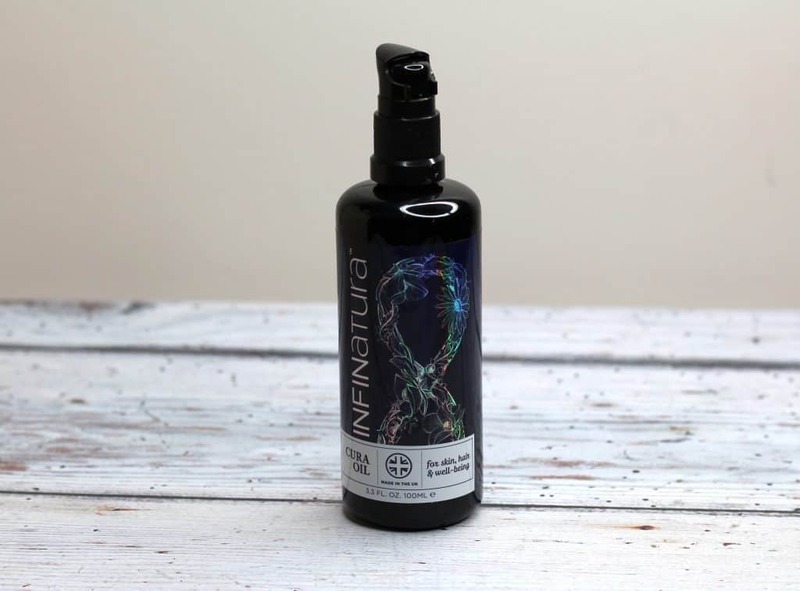 INFINatura is safe to use in pregnancy due to its blend of eight 100% natural oils. As a pregnant woman, this is hugely appealing and it was recommended to me by someone who also suffers with psoriasis. 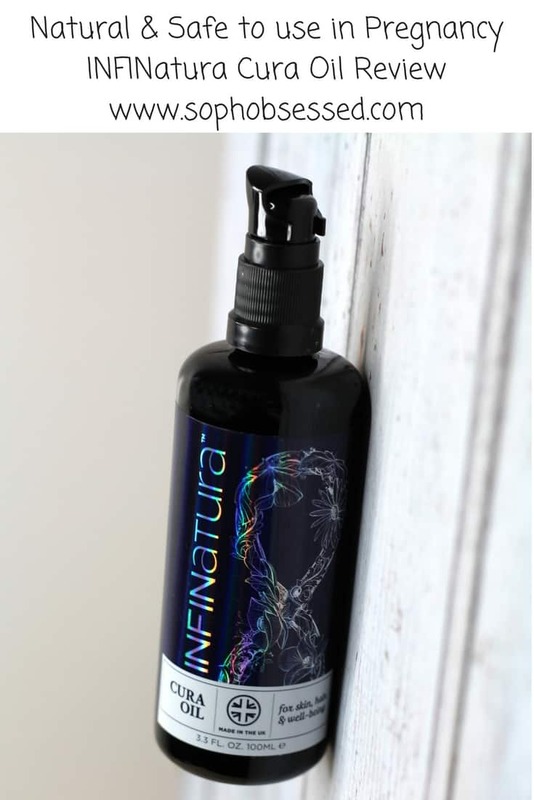 INFINatura is a multi-purpose oil. For me I have been massaging it into my stomach which can be helpful for stretch marks during pregnancy. Due to the cold my hands have become dry especially around the cuticle area so I have been massaging this into my nail beds. Of course, I have been using INFINatura on the psoriasis patches which have cropped up. My skin feels and looks better since I have started incorporating INFINatura daily. I like the fact that I don’t need to use too much of the product and that it absorbs into the skin quickly without leaving an oily residue on the surface. The smell is very pleasant and natural. There isn’t a strong chemical or artificial perfumed scent which I really liked. I have been using the oil on my six-year-old son as a massage type oil before bed. The combination of the scent and feel of the oil has been really helping him relax and unwind before bed! If only someone would do this for me hint hint husband!! 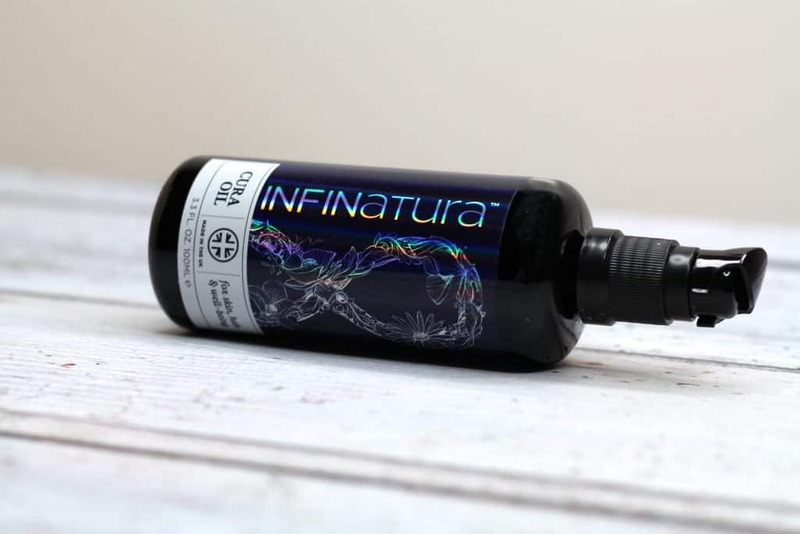 INFINatura comes in a beautiful glass bottle with a pump action top that doesn’t release an excess of product which of course reduces waste and prevents you using too much! I adore the scent and the way my skin feels after use. As it absorbs quickly into the skin there is no need to wait after use which as a busy mum means I am more inclined to use it. My psoriasis patches feel and visibly look better after using for the last two weeks. This has reduced itching and has made me less self-conscious about showing my arms. I have also been using INFINatura as a facial oil and make up primer. INFINatura Cura Oil is great as an anti-wrinkle treatment and as I am getting older this is something I am conscious of. The oil absorbs into my face nicely without making my skin too oily. I’m nervous about using oils on my face in case it instigates a break out but this hasn’t been an issue at all. When I use this oil on my skin my makeup applies flawlessly and stays in place all day. There isn’t anything that has stood out to me as a dislike of the product. The price could be off putting to some as it is £34.99 for 100ml. I would say however that you – of course get what you pay for and cheaper oils are often diluted down so less effective. Considering I have used this product for over two weeks on both myself and my son you can’t even see the bottle going down. This is an oil that will last because you simply don’t need to use too much so when you look at the amount of use from a 100ml bottle I think the price is more than fair. You can find out more information and where to purchase from the INFINatura website here. *I received a sample of INFINatura Cura Oil on a gifting basis in return for an honest review. As always all views, opinions and words remain my own. Some images were provided. For more information on any of this please head over to this page.